Joe: Hey, it’s Joe Crump. 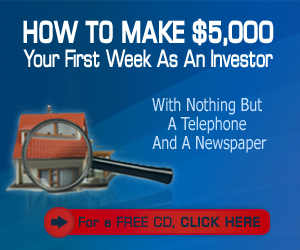 Today I’m going to give you a brief outline of how to build a million dollar portfolio in one year. Now, that’s not a million dollars’ worth of equity, that’s a million dollars’ worth of property. 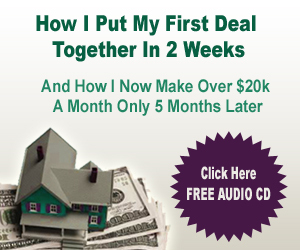 How do you buy a million dollars’ worth of property with no money, without using your credit, and do it from you home. And do it anywhere in the country that you like. 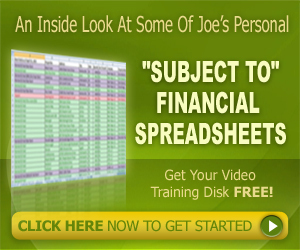 Joe: And the way to do that is by taking the deed. And the technique is called “subject to.” Taking the property subject to the existing loan. The way subject to works is that the seller has a property, they have a mortgage on it, usually that mortgage is pretty close to its real value in property. So, let’s say you’ve got a property that’s worth $150K, it’s got $140K worth of mortgages on it, or one mortgage worth $140K. Let’s say the mortgage cost $1,200 a month and it brings in $1,500 a month in income. So, $1,200 PITI $1,500 in actual income. That gives you about $300 a month positive cash flow. And that’s if you’re managing it yourself. 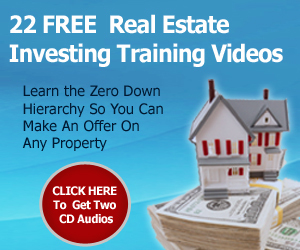 If you’re not, then it’s about $200 positive cash flow if you’re paying somebody else to manage the property. Which is what I do. Joe: And you probably don’t need to do that until you get three or four properties, but if you’re doing what I’m talking about right now, you’re going to have ten properties within a year. Because you can do this once a month with subject to properties. 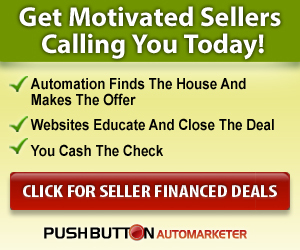 You should be able to find one a month pretty easily in any area that you work in if you understand how to talk to the sellers and how to show them that it makes sense for you to do that. 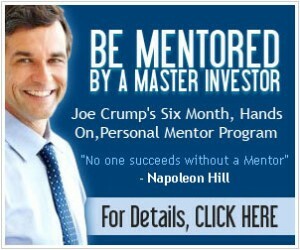 Joe: Now, in my mentor program in the Pushbutton Method, I have training programs on how to do subject to’s. And subject to’s are a great way to build this portfolio because you’re going to buy it subject to. They’re going to deed you the property, you’re going to make the payments on their property, you’re going to sell it on a lease option, and try to get, in this situation maybe $10,000 down. They’re going to give you that $10,000, maybe $5,000 in cash maybe $5,000 in a promissory note or you know, monthly payments that they’re going to make. 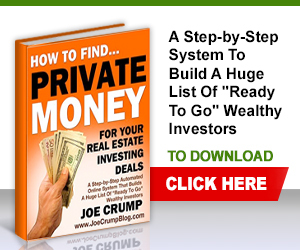 Joe: You’re also going to get the monthly income from that property. You’re going to get the tax benefits, the depreciation on that property. If they don’t exercise the option you’re going to get the appreciation on that property. 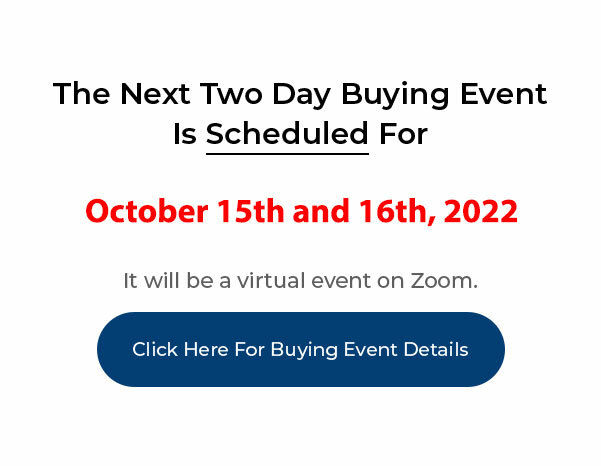 You’re going to sell it for more than you paid for it, so let’s say you’ve bought it for $140K and it’s worth $150K and you sell it for $160K and you get the $10K down. You still have $10K of equity. If they do exercise the option, you’ll make another $10K when they close the property in three years, if they’re doing it on a lease option, and they exercise it. 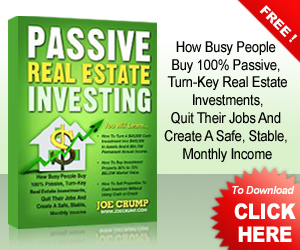 Joe: If they don’t exercise the option, that’s even better because then you’ll get to keep that property, the values will continue to go up, you’ll continue to get the, the rents will continue to go up, you’ll continue to get the depreciation on the property, you’ll continue to get the appreciation on the property. You’ll be able to sell it with another lease option and get another $10K as a down payment, so that one property, the $150K, you need eight of those and you’ve got $1M worth of property. And, at that time also, another you know, $50K to $100K in equity because you’ve turned around and sold it for $20K more plus you made another $10K on each property. That’s another $80K you made for the year, you know, just in lease option fees. Joe: Now. Big important caveat. Don’t take the entire lease option fee and spend it on your life. You know, don’t use that just as income. Use that and put it into an escrow account, into a bank account where you’re not going to touch it. You know, every time you have a tenant, there’s going to be wear and tear on a property and sometimes they’ll be harder on it than others and you’ve got to send people in there, you know, clean it up, and get it ready to rent again, get another $5,000 or $10,000 as a lease option fee and get it sold again. Joe: I’ve known people that have sold properties three and four times in a year on lease option where people would move in, move out, move in, move out and make a chunk of money every time they did that. So, this could be a wonderful way to build a portfolio that you keep for the long term. After you get three or four properties I like the idea of getting property management, professional property manager who will fill the properties for you so you don’t have to deal with tenants anymore and you can keep moving along. Joe: Now. 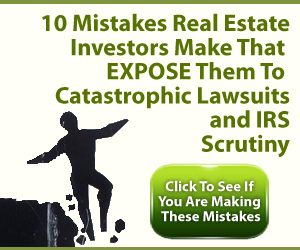 With all this said, you’re building this portfolio and the way you’re going to find these people is talking to for sale by owners is a great way to do it, and the way we find your subject to’s is, we’ll go to for sale by owners and we’ll ask them if they’re interested in doing a rent to buy. And that opens the conversation. Joe: And then we start asking them questions about their situation and we’ve got a seller questionnaire that’s in the Automarketer that you can fill out that asks them, you know, where are you moving to, why are you moving, what are you trying to accomplish, how much equity have you got in the property, how much do you owe on the property, what are your monthly payments – all these things that are really important. And if you understand what those, the answers are to those questions, then you can design your offer around that. You’ve got to make an offer that you know that you can accept, that you can manage. But also an offer that’s going to make sense for them. And you can give them different options. You can give them the lease option option, where you just go in and find them a lease option buyer and boy, get them, you know, full price and they’ve still go that and they can take advantage of that and it’ll be a good long term investment for them. Joe: Or, if they just want to get rid of the property, and there’s going to be a smaller percentage of people that are like this, but there’s going to be a certain amount of people that just want to get rid of the property. They don’t want to deal with it again. They know they don’t have much equity in the property and they just want to get rid of it. And they’d be willing to sell it to you as long as you promise to make those payments to them. And remember, you’re not qualifying for this loan. You know, you’re just making the payments. You’re going to get the deed to the property, they’re going to deed it to you, and you’re going to record that deed, probably, and then you’re going to own that property. And that’s going to be part of your portfolio. And part of your retirement and it’s going to give you benefits on your taxes all the way through the rest of your life. Joe: Anyway. That’s how you can build a portfolio that quickly. 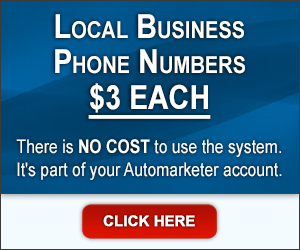 Use the Automarketer to bring in the leads, use those leads, analyze each one of them that comes in, and then decide which is the best deal. You’re engineering the deal with each person you talk to. And you’re going to find the best thing for them and the thing that works for you as well and makes you a profit.